Making a signal and making noise are both acts that result in the production of different sounds. These can be done by a human, animal, machines, or by hitting things against each other. The only major issue comes in when one cannot identify when a signal is a noise and when to qualify a noise to be a signal. Apart from the normal day-to-day application, noise and signal are highly applied in the electrical engineering and communications fields. 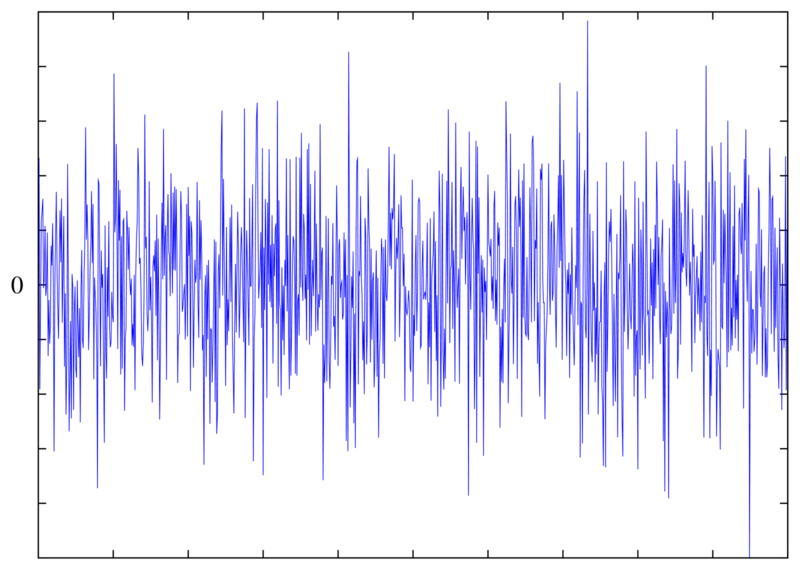 In these fields, noise is regarded as any unwanted effect on the signal and one which reduces the visibility of any information that is being relayed. Signal, on the other hand, is considered as a space or time-varying quantity that carries some information. In light of that, unless for the case of experts in the respective fields, understanding the differences between noise and signal becomes a difficult task. However, getting deeper into each, understanding their various types, and defining them can separate the two. So, dive deep into this post and get more insights about these contrasting topics of the same family. A signal can take different forms ranging from movements to actions, motion, and sound. In this case, we look for the sound meaning of a signal. From a physics standpoint, a signal is any electromagnetic field or electric current that is used to convey data from one point to another. When it comes to deeper communication systems, electrical engineering, and signal processing, it is defined as a function used to convey information about the attributes or behavior of some phenomenon. It can also be taken to mean any observable change in any quantifiable entity. Motion: – when an object makes a motion, it can be considered to be a signal. It can also be monitored using various sensors to provide signals. Sound: – a sound is a vibration through a medium such as air. It associates a pressure value to values of time and three space coordinates. Usually, for sound to qualify to be a signal, it has to be converted into an electrical signal by a microphone. Images: – an image or picture consists of a color signal or brightness. The object appears as a reflected or emitted electromagnetic wave, a form of electronic signal. Other signal types are videos and biological membrane potentials. A signal is an information carrier which is a space and time-varying quantity and is used to send the information it carries. Noise, on the other hand, is any unwanted sound or effect on signals. A signal has credibility while noise begs for attention. Signals whisper to the tribe while noise promotes itself. A signal will cause you to take initiatives while noise will want you to join the cause. A signal is also an original sound while noise is a random sound added to the original signal. A signal is usually the wanted part while noise is the unwanted one that should be eliminated. A signal qualifies to be of high quality since its signal to noise ratio is high while the signal to noise ratio of noise is low. It is quite easy to mistake between a signal and noise. In most cases and depending on the environment, it becomes even harder to tell whether a sound is a signal or noise. However, if the background is clear without other unclear sounds, it is easy to distinguish whether one is sending a signal or just making noise. Sarah Brown. 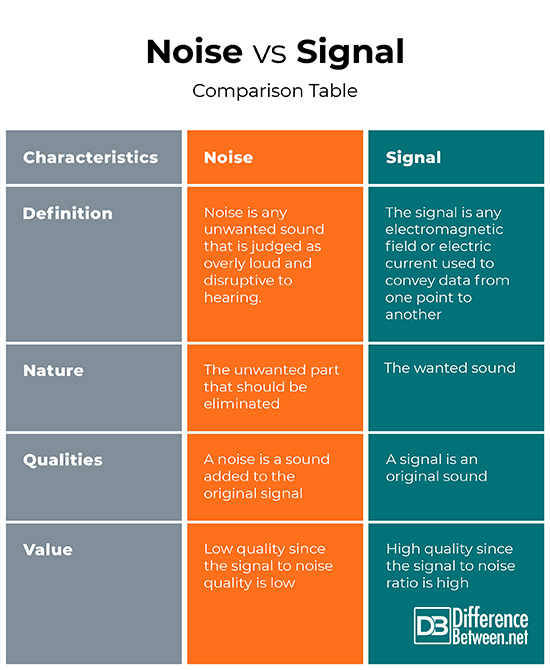 "Difference Between Noise and Signal." DifferenceBetween.net. January 17, 2019 < http://www.differencebetween.net/science/difference-between-noise-and-signal/ >. "What Are The Different Types Of Noise?". Noisenews, 2018, https://www.cirrusresearch.co.uk/blog/2015/01/4-different-types-noise/. Accessed 7 Dec 2018. Sexton, Kyle. "The Difference Between Signals And Noise". Kylesexton.Com, 2018, http://kylesexton.com/259-the-difference-between-signals-and-noise.html. Accessed 7 Dec 2018.